Correct placement of your Onion Lanterns is important. Here this pair of antique brass OL8 onion lights sit at a height in line with the doorway finish trim and the correct distance on either side to create an overall appealing aesthetic look. Whether you prefer antique copper or Brass Onion Wall Lights, Hammerworks Model OL8 is a perfect choice! 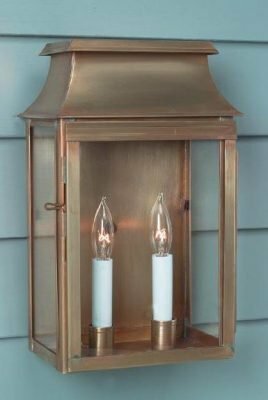 Ideal for the front entryway of a smaller home, these onion style Colonial Wall Lanterns add a Cape Cod flair. Most notably, we handcraft onion wall fixtures in several sizes. Therefore, for a larger home, consider placing the Brass Onion Wall Lanterns OL12 or OL10 on the front. Certainly in such cases, the smaller OL8 or perhaps the petite Onion Wall Lights OL6 are suitable for a side or back doorway. Of course no matter the size, each Colonial onion light is skillfully handcrafted in New England by experienced craftsmen. Furthermore, we use only high quality solid copper or brass to ensure long lasting durability. In addition to reproduction Colonial Onion Wall Lights, we offer additional Onion Light Styles. Create a lasting impression when you place Colonial Onion Post Lanterns PRG12 or Onion Post Lights POL12 in front of your home. 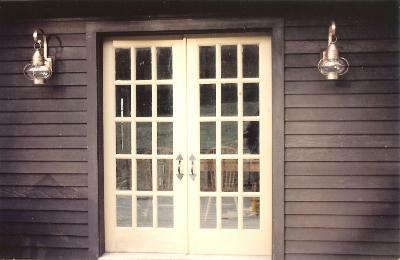 Do you have a Farmer’s Porch that needs overhead lighting? Our Colonial Ceiling Onion Lights are available in 4 sizes. Furthermore, you can choose either the ceiling mounted or hanging pendant styles. As a result, we are your complete source for period reproduction Colonial Onion Lights. At Hammerworks we are also proud to offer an extensive selection of Colonial Wall Lanterns. 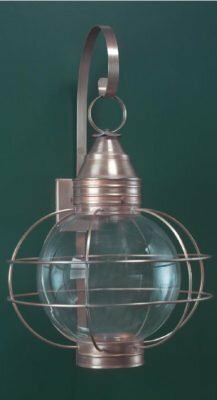 Whether traditional or rustic in design, you can combine any style to contrast with the simple classic look of your brass onion wall lanterns. 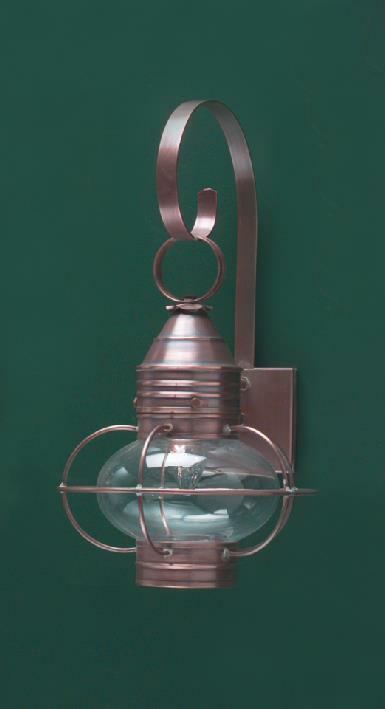 You will love the look of Copper Colonial Wall Light Barn Lantern W101 on your garage. Or perhaps the classic lines of Traditional Wall Lanterns Small Sturbridge WML102 are more your style. Either way, we have the size and style Colonial Wall Lanterns for you. Buy superior handcrafted Colonial Lighting from a trusted name since 1979.